www.electronicwritingtablet.com is a website in Grand Theft Auto IV. 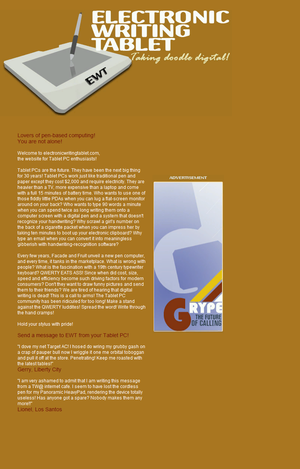 It is a site for tablet PC enthusiasts. The site is against the keyboard and supports writing on tablets as the next big thing for the future. Users on the site mention the Panoramic HeavyPad and the Target AC(though this was mentioned during a heavily misspelled praise, mocking the poor handwriting recognition software of some Tablet PCs, and may have simply meant Tablet PC.) and it is also mentioned that every couple of years, Fruit Computers and Facade release new tablets but these are not as widely embraced as they should be. Ironically, in 2010, a Tablet PC was released to the general public to rave reviews and huge consumer purchases, by Apple Computers called the iPad. This page was last modified on 16 November 2012, at 23:27.